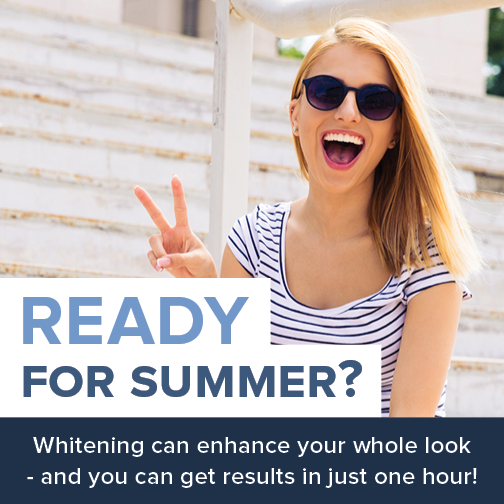 Summer Ready Teeth Whitening, Anyone? Summer, sunshine, laughs, fun, love – what better than to add to all the above with a beautiful, bright smile?! Here at Shoreline Dental, we care about your happiness. From a survey we found from the American Academy of Cosmetic Dentistry, 45% of people agree that a smile is the most attractive feature on an individual. In addition, another of their surveys specifies 99.7% believe it is the most important social aspect that people want to change the color of teeth the most to improve their smile. If this data speaks to you, you may be interested in teeth whitening! If you’re feeling that your smile is inadequate, let us help you. We offer in office and take home whitening kits to help you achieve the bright smile you desire! Shoreline Dental is a proud partner of Opalescence. We have sample whitening kits for you to try and if you like those, we can order take home kits for you. If you want a stronger power, we offer their BOOST whitening as an in office whitening treatment. The appointment is a simple one. We do a few intervals of bleaching for 10-15 minutes at a time and you leave our office a few shades whiter! Piece of cake! If you think whitening your teeth with improve your smile and self confidence – give us a call at 206.440.0065 and we’ll be more than glad to give you all the details!